The PGH’s central administration building—standing since 1909—will receive a major upgrade thanks to fresh government funding. 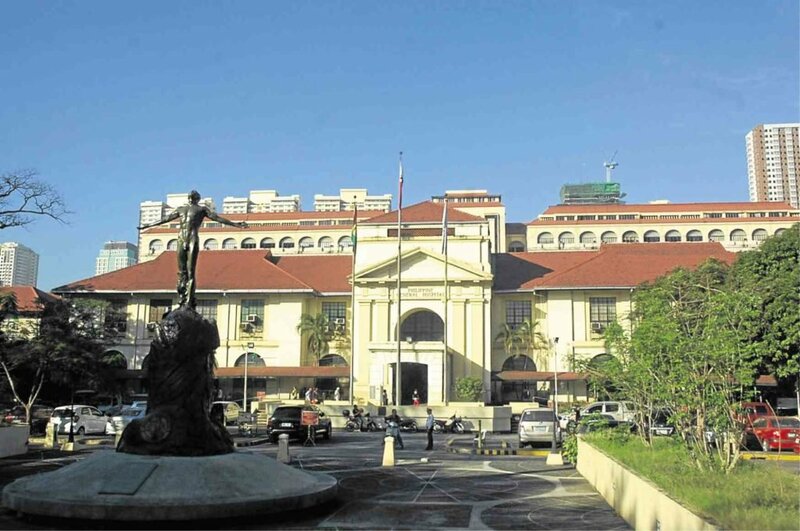 Contrary to popular perception, the Philippine General Hospital (PGH)—one the largest government-run medical institutions in the country—is no longer the cash-strapped and resource-starved medical facility of years past. No longer will visitors see people lying on gurneys along the corridors or long lines of indigent patients in long queues waiting to be admitted. There are fewer dark hospital rooms and crowded charity wards with only the barest of medical facilities. And there is even an airy new hospital wing with fresh paint, shiny tiles and a (relatively) affordable presidential suite to accommodate more affluent patients wanting to be treated by PGH’s medical staff renowned for its expertise. Once infamous for being the last resort for those who could not afford more expensive medical care, the hospital has changed and continues to change for the better. PGH’s medical director Dr. Gerardo Legaspi remembers a time when inadequate funding from the state meant that the country’s premier government healthcare facility—the so-called “hospital of last resort” in the eyes of millions of indigent patients nationwide—meant a constant struggle for its medical staff which had to perform under extremely adverse conditions. This was aggravated by the fact that the hospital was run by doctors whose primary focus was the delivery of health services. Many were ill-equipped for the critical task of managing limited resources to satisfy the nearly unlimited needs of patients. Of the 600,000 patients PGH treats annually, 50 percent are patients from the National Capital Region, 30 percent are from further out in the Calabarzon area (the urbanized provinces to the south of the capital), while the remaining 20 percent are patients coming from various parts of the country, some from as far north as Ifugao and as south as the Autonomous Region of Muslim Mindanao. A renowned neurosurgeon, Legaspi recalls that his life and outlook as a doctor was very different before his epiphany. “As a neurosurgeon, you’re on top of the food chain, you earn the most, you get the most glory,” he says. But all that changed after an encounter he had in 2009 with a German medical student who was on a study tour. Legaspi brought his thoughts before the hospital’s management at that time, which then challenged him to put his insights to good use by appointing him head of PGH’s so-called “pay hospital” unit—the division in charge of providing services to paying patients as opposed to the larger unit which provides free medical services to indigents. The neurosurgeon called on every management skill he was familiar with in an effort to improve the efficiency and productivity of PGH’s pay hospital division, which had 400 beds at its disposal (as opposed to the 1,000 beds for charity cases). Knowing he needed funding to improve the facilities of the pay hospital (the earnings from which are used to augment the resources of the free hospital), Legaspi contacted the alumni network of the University of the Philippines’ medical school based in the US. Legaspi and Health Secretary Paulyn Jean Rosell-Ubial visit the infant’s ward of the country’s largest government hospital. He made them a proposition: Each $5,000 donation the alumni would put up for the renovation of a single PGH private room would be matched equally by the hospital to equip these rooms with new beds, flat screen TVs, appliances and other facilities. The response was overwhelming and, to date, the program has raised over $800,000 over the last five years, resulting in a new hospital wing that could compete with the best that private hospitals have to offer. More importantly, PGH was able to raise its private room fees to P2,000 from P1,500 a night, which meant revenues rose to P120 million a year, compared to only P40 million before the renovations—fresh resources which then helped support PGH’s free healthcare services for its less affluent patients. Despite this success, Legaspi—already then promoted to medical director of the entire UP-PGH system, covering both free and pay hospital divisions—is not resting on his laurels. Fortunately for the PGH and patients who seek treatment there, the government has recognized the key role it plays in delivering much needed healthcare services to the people, and has responded accordingly. Under the Duterte administration, Legaspi notes the challenge facing the PGH management has shifted from the former situation of having not enough to one of efficiently deploying a surplus of resources to help as many beneficiaries as possible. “We have P100 million a month in funding from Malacañang, and it will be topped up if we can finish it. A month!” he says, adding the hospital is now reorienting its systems to be able to utilize these resources—in stark contrast to the previous situation of constant want. Legaspi (right) leads US Ambassador to the Philippines Sung Kim (left) on an inspection of the hospital’s facilities. To make sure these resources are used efficiently, Legaspi hired professional managers to help revamp the PGH system, including information technology professionals to better utilize technology and medical databases. The goal is to reduce patient waiting time, deliver faster testing results and increase patient turnover rates. A new emergency room is also being built, which will allow the hospital to serve as many as 200 urgent care cases simultaneously, representing a sharp increase from the current facility. Through it all, Legaspi reflects that managing a surplus of resources can be just as challenging, sometimes even more so, than struggling with a deficit. “What’s important is that we now have tools we need to do our jobs—tools that we didn’t have for so many years,” he adds. It’s a problem—but a good problem to have.